On Sunday 2nd December Reverend Anne Hindle held a delightful candlelit Christingle service at St Andrew’s Church, Cotterstock. Although we were few in numbers, it was a lovely, intimate family occasion where we listened to the story of St Lucia and her relevance to the meaning of Christingle. We managed to raise £160 for The Children’s Society which is fantastic and will go to help children in need who are less fortunate than ourselves. I would like to thank Honour and Matilda Somerville-Cotton for helping to make the Christingles and Rowena for her help too. Many thanks to Monica for playing the organ and to everyone who came along to the service and who donated to this worthy cause. Nicholas Elks conducted the first full peal of our refurbished church bells on Monday, 19 November 2018. It took two hours and forty five minutes for Angela Whiteway, Marion Robinson, Susan Marsdon, Steven Milligan, Jain Haydew and Nick to ring the 5040 permutations. This was not only the first peal on the bells after their augmentation to six but also the first time that Angela had rung a full peal, so a great achievement for her and they did it on Nick's birthday too! The ringers toasted their success with bubbly provided by Rev David Bond. We really are in awe of the concentration required to ring a full peal so very well done to everyone. Sunday 11 November at 6.00 p.m.
Our Remembrance Service was all the more poignant this year as we commemorated the centenary of Armistice Day. It was, as ever, a very well-supported service and people could watch our memorial bells being rung on the television as they arrived. We were very touched that Angela Wright came from London especially for the service and we appreciated her support. Les Stark, the Chair of Oundle and Thrapston Royal British Legion, attended dressed in his Guards Regiment uniform along with Mary Prosser the British Legion Standard Bearer. Les gave the Exhortation and Kohima with reverence and precision. The last post was played impeccably by Harrison Smith from Oundle School. Major Martin Niven read “In Flanders Fields” by John McCrae and Elaine Brooker and Fabian Sommerville-Cotton read lessons too. Emerald and Brandon Crozier, Alice Bennett and Matilda Sommerville-Cotton came in their army cadet uniforms. They placed knitted wreaths on the altar in memory of the servicemen from the village who died in action. Their names were read out by Graham Sands whilst their respective bell was tolled. We remembered Charles Stapleton, Frederick Sharp, Albert Berridge, and Kenneth Dundas. Les Stark spoke movingly to the congregation to say that he would be standing down as Chair of the Oundle and Thrapston Royal British Legion at the end of his term of office. He said how much he had enjoyed attending Remembrance Services in Cotterstock over the past four years and thanked the village for their generosity. 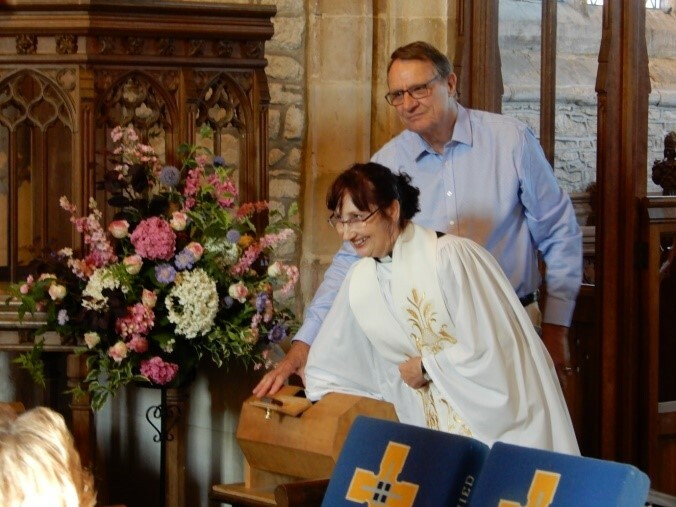 Adding greatly to the occasion, Jo Poulter created a stunning arrangement of poppies and foliage in front of the north door whilst Mavis Rowlett and Cherrill Sands presented an arrangement of white roses together with a variety of green foliage (including rosemary) on the font. Hot drinks and Anzac biscuits were served after the service. The collection from the service was donated to The Royal British Legion. 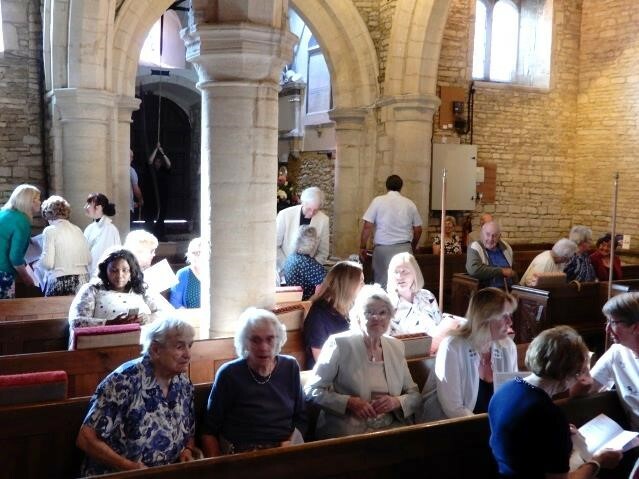 Angela Wright, a London based artist, returned to Cotterstock on the 31st October to create an art installation in St Andrew’s Church commemorating the centenary of Armistice Day. This collaboration came about because of the positive feedback received from the amazing wool work that she displayed as we celebrated the return of our Church bells in 2017. Angela chose to work with chicken wire because “Sometimes soldiers built mazes from the wire. These were designed to coral enemy soldiers into specific areas. Machine guns would be trained on those killing zones, ready to shoot the enemy if they were herded within range. Barbed wire was difficult to defeat. Cutting it with wire cutters proved nearly impossible under attack. Exploding shells often had little effect on the wire. The barbed wire only became more tangled as the shells blew it into the air; the wire coils absorbed the energy of the blast. In time, troops solved the barbed wire problem using chicken wire. Tossing rolls of chicken wire over the barbed wire created a kind of bridge, enabling soldiers to crawl over the barrier. American soldiers also developed “Bangalore Torpedoes” – metal cylinders filled with dynamite. Soldiers pushed them under the barbed wire, exploding an opening in the barrier”. Angela also incorporated 1500 poppies into the installation which took three days to complete. All these poppies had been crocheted or knitted by villagers, their families and friends. The installation resembled a huge wave that cascaded over the altar and rippled across the chancel floor covered in carefully placed poppies and was a very evocative and moving tribute to the fallen. On the evening of Friday 2nd November people had an opportunity to meet Angela and listen to her talking about her work in Cotterstock whilst enjoying a glass of wine and nibbles. St Andrew’s was open all weekend on Saturday and Sunday for people to view the installation and to watch a very moving video of photographs, extracts from Pathe newsreel and clips from the time about the Great War and also the celebrations of the homecomings. This had been carefully pieced together by Bob Davies and played on a loop all weekend. Visitors donated generously to St Andrew’s and The Royal British Legion. The comments in the visitors’ book are testament to how moving they found the whole experience. The PCC would like to thank everyone who helped in any way for making this weekend so successful. Friday 2nd November at 7.00 p.m.
As part of Cotterstock’s Commemoration of the centenary of Armistice Day, our local historian Reverend David Bond gave an illustrated talk entitled “War Memorials and the Significance of the Poppy” in St Andrew’s Church. From David’s talk we learnt that the nature of War Memorials of one sort or another has changed considerably over the centuries. Before the 19th Century memorials tended to be either celebrations of victories or records of the achievements of national or local leaders. During the 19th Century this began to change but the real revolution came with the First World War. The sheer scale of the loss of life meant that nearly every community had a memorial of some sort. There was a great sense of loss and now everyone was remembered while many questioned the real significance of the war. As a result there were a huge number of memorials created and they took many different forms; this trend continued with the Second World War too. David’s talk looked at War Memorials and what they tell us not only about war itself but also about the society that created the memorials and about our response today. His talk was very moving and we were left looking at the last slide - a charred cross against the backdrop of the ruins of St Michael’s Cathedral in Coventry, which was devastated by a German bombing raid that lasted over 10 hours in 1940. On arrival people were given a fleecy blanket to keep them warm throughout the talk. They then enjoyed looking at Angela Wright’s art installation accompanied by wine and nibbles. It was a most successful evening and both David and Angela were there to chat to people afterwards. We are very grateful to David for all the research that went into such an informative talk and to Angela for her obvious creative talent. 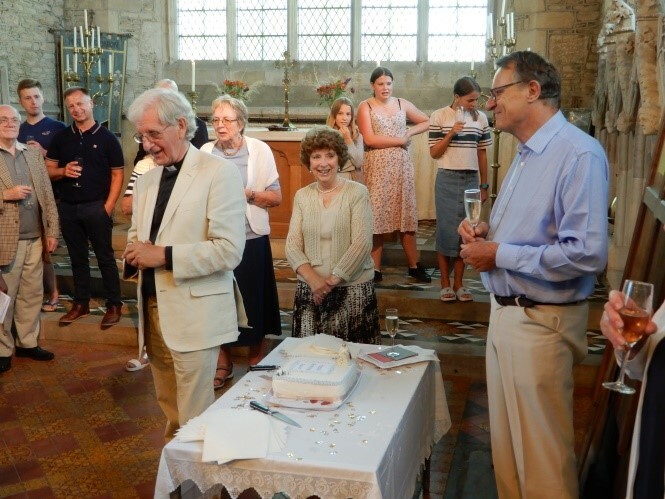 St Andrew’s was packed for the Family Service on Sunday 22nd July as villagers and friends of Reverend David Bond took the opportunity to surprise him with a rendition of “Happy Birthday” since David had celebrated his 80th birthday on Thursday 19th July. 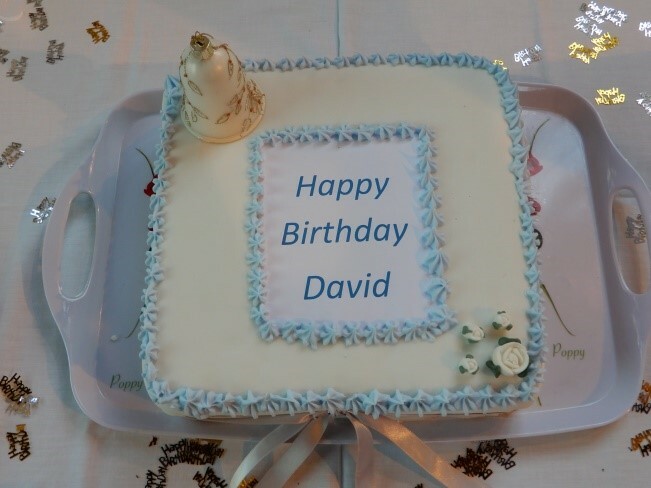 We all know that David doesn’t like a fuss but there was no way that such an important occasion could pass without us marking it in some way. It was amusing watching David as the Church filled up and he was greeting people that he doesn’t normally see at church and slowly he began to realise why they were there! Everyone agreed it didn’t seem possible that David could be 80 and there must have been a mistake but he assured us all that it was true. Cherrill Sands had baked and iced a delicious birthday fruit cake which David cut and everyone enjoyed a glass of bubbly to celebrate this milestone birthday with him. Graham Sands raised the toast and took the opportunity to thank David for all that he does and has done for Cotterstock over the years. An extra-large birthday card had been made with pictures of David on the cover and villagers had all written little notes in it for him; Graham presented it to David. 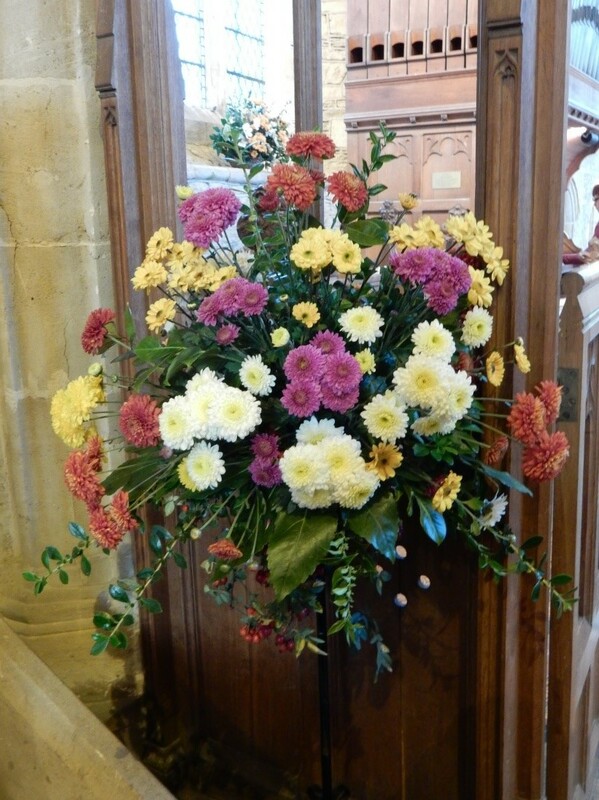 Mavis Rowlett had created a beautiful floral arrangement in front of the pulpit and another on the font. David and Rowena read the lessons and Honor and Matilda organised the collection. The bell ringers conducted by Alex Dyer rang to herald the start of the service and stayed to celebrate with David, their fellow bell ringer too. It was a special occasion and must have shown David how much he is liked, respected and appreciated in Cotterstock. Graham Sands also organised the 100 Club draw; and this month there was the additional Super Draw for £100 which was drawn by Reverend Anne. Now there are only 4 numbers left if anyone has a desire to join this exclusive club. 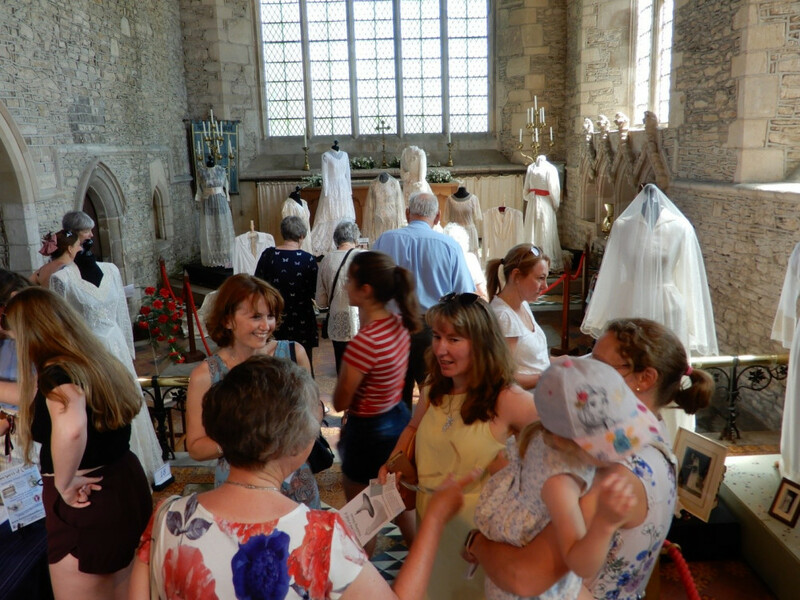 Over four hundred people visited Cotterstock on the weekend of Saturday 30th June and Sunday 1st July to see our “Century and a Half of Wedding Dresses on Display” exhibition. 29 dresses dating from 1870 to the present day were displayed on mannequins along with veils, shoes photographs, etc. Visitors received a programme on arrival that told them a little about the dress and the wedding day which were written by the current owners of the dresses. Some dresses were symbolic of significant times in history such as Emma’s dress, she married her fiancé in 1908 and he was killed at the Battle of the Somme in 1916. Visitors saw Emmie’s dress; she married Harry in 1935 at Thurning Church at 8.00 a.m. so that they could enjoy a wedding breakfast in the school room and get to Bournemouth for the honeymoon by dusk! Jo Poulter from Bespoke Buds in Peterborough had replicated some of the bouquets from the wedding photographs so visitors could see how fashions in bridal flowers had changed over the decades. 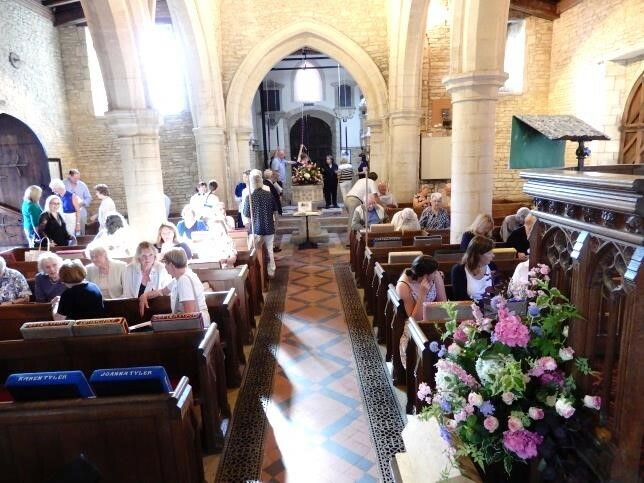 The organisers were very grateful to Kate Cheaney who kindly left the beautiful flowers from her daughter’s wedding of the previous week in the church so St Andrew’s looked resplendent and smelt very fragrant too. A video presentation that charted the changing trends in bridal gowns over the decades and showing clips of iconic Royal Weddings was playing throughout the day. Nigel Hill from Harpur’s of Oundle displayed some precious antique and modern bridal jewellery including a Russian wedding necklace from 1745 and Hockley’s Cakes of Brixworth exhibited a very tempting wedding cake to complete the bridal scene. 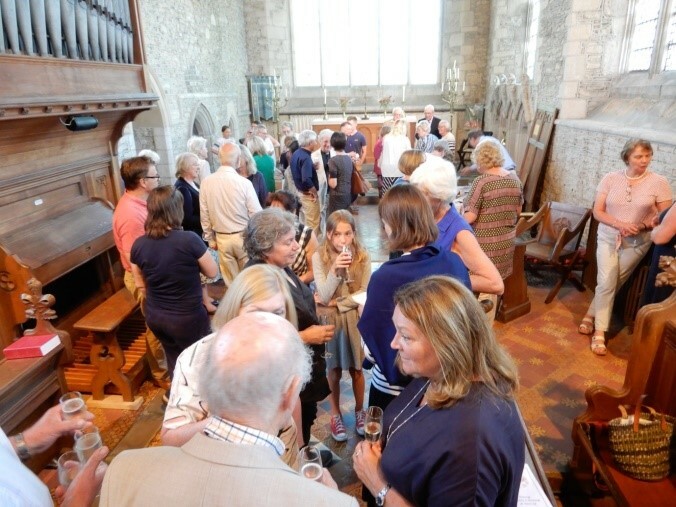 The organisers would like to thank everyone who helped in any way to make this exhibition the success that it was and next time you are in Cotterstock Church, please take time to read some of the beautiful comments that were written in the visitors’ book. On Sunday 29 April many of the graves in the churchyard were decorated with a flower arrangement or a plant as we held our first “Adopt a Grave” service. This was the idea of our hardworking churchwarden Cherrill Sands and her husband Graham who said that for one weekend in the year it would be lovely to see graves that are rarely tended decorated. Villagers were encouraged to come to the church, read some of the inscriptions on the gravestones and just to spend moment thinking about the person at rest there. 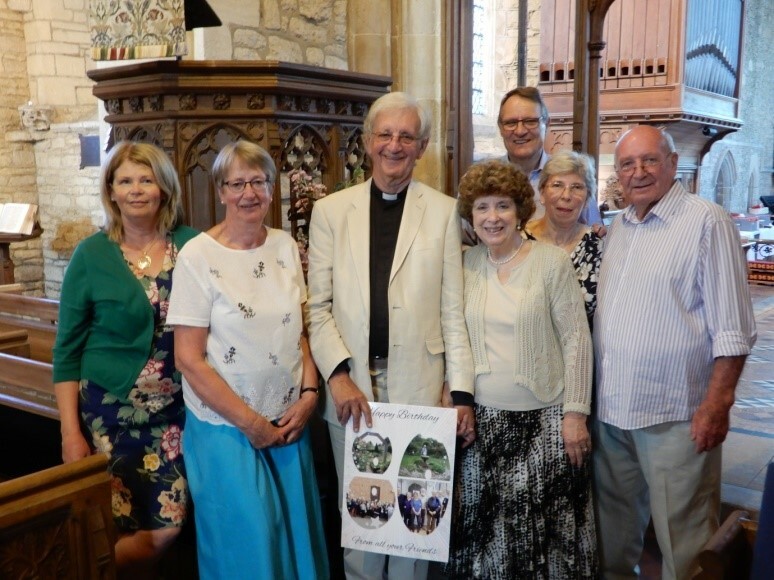 Reverend David Bond told the congregation a little about the lives of six of the notable people in our churchyard and, as he spoke, images of their gravestones were projected up onto the screen to making it easier for people to locate them in the future. 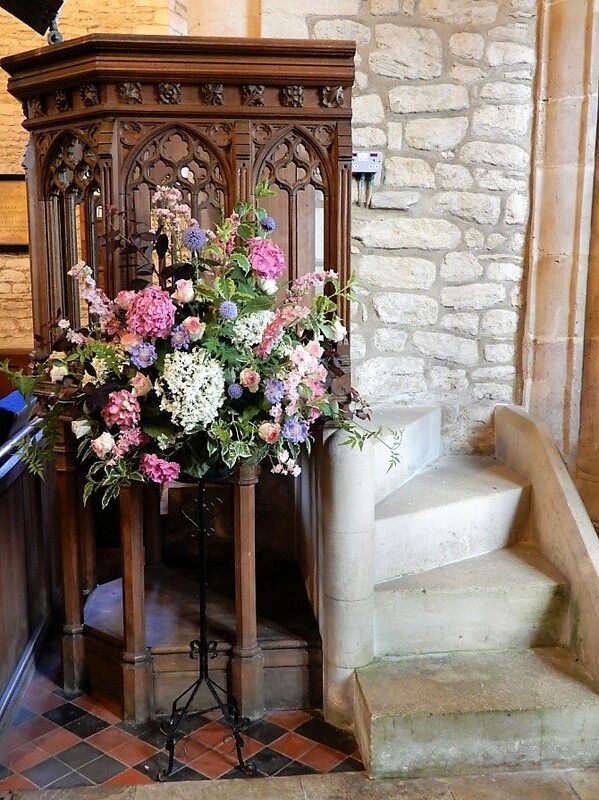 Cherrill Sands and Elizabeth Rooms created a beautiful Easter Garden in front of the font, for the 9.00 a.m. Communion Service in addition to an arrangement in front of the screen. Wednesday 28th February - The snow in bitter cold fell all the night, and we awoke to see St Andrew's swathed in a blanket of snow, so pretty. 2018 has got off to a flying start thanks to Graham and Cherrill Sands who investigated the idea of running a 100 Club with all the proceeds going to St Andrew's. With the help of Jeff Rowlett our treasurer and the support of the PCC this was launched at a party in the village hall in February. The wine flowed, the canapes were enjoyed as Graham explained how the 100 Club would be organised and managed.